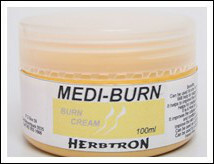 Medi Burn was formulated for burns. It is used in hospitals against 3de degree burns. Can be used for any form of burns including nappy rash. It helps to improve the skin condition. Helps for cracked skin. It is a heel balm. It improves the cuticles of the nails and conditions the skin in general. Can be used as a lip balm and can be used for any dry skin. Ingredients: Acriflavine Emulsion 0, 1% m/v, Ung Emulsificans BP, Baby Musk and Tea Tree Oil.